Pascal Le SegretainThe success of ‘Jaws’ ultimately helped Spielberg take over Hollywood. 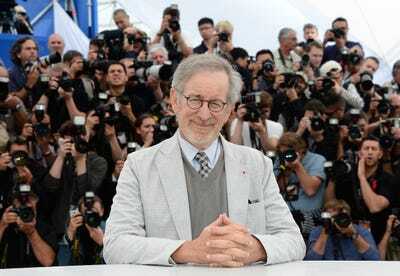 At this point, Steven Spielberg has directed so many movies that it must be almost effortless for him. But of course, that wasn’t always the case. The disastrous shoot of “Jaws” has become the stuff of legend. It went over budget and over schedule, while the mechanical shark kept malfunctioning. And while the experience was tumultuous, it led to nothing but good things for Spielberg. “Jaws” became the highest grossing film of all time until “Star Wars” beat it out two years later. It arguably ushered in the era of the summer blockbuster. Universal via YouTube‘Jaws’ endured a notoriously troubled shoot. Plus, the issues with the shark ended up being a positive: because it didn’t work, Spielberg decided to show less of it. Most of the movie’s terror is based on the fact that you rarely see the shark pop out of the water. While a shoot that difficult can usually ruin a young director’s career, its eventual success gave him unprecedented power in Hollywood. The lesson here: if you can make a broken mechanical shark useful, then you can do just about anything. Read the full piece here. Spielberg’s latest film, “The BFG,” will be out in theatres on July 1.